I have spent years treating patients for their health issues, and I have witnessed firsthand just how powerful food can be in either fueling disease or facilitating optimal health. I have watched the fallout from trendy diets that failed those who followed them, and I have watched some of them succeed temporarily, but ultimately fail. This is why I believe it’s time to dump diet dogma and food fads for good. Instead, let’s put together a realistic, science-based plan that will help your body thrive, even as we live in an age when the incidence of chronic health problems continues to skyrocket. Before we begin constructing a sensible dietary strategy that can work for you, let’s consider what our goals will be. One of the most important, in my experience, is to address something that is probably happening inside of you, standing in the way of your optimal health. At the root of almost all modern-day health problems, including heart disease, cancer, autoimmune conditions, and even stubborn weight loss resistance, is inflammation. This is one commonality we can not only pinpoint, but that we can actually do something about. An estimated 50 million Americans have an autoimmune condition, and that is not including the millions more that are on the autoimmune-inflammation spectrum but don’t have a diagnosis. One in two men, and one in three women, will be diagnosed with cancer at some point in their lives. All these health problems are now common, but they should certainly not be considered normal. It’s important to understand that these dangerous health problems don’t just pop up out of nowhere one day. No, they start with the slow burn of inflammation, which is likely to be mostly if not completely unnoticeable at first. This brewing inflammation storm can continue on for years, and as you go on about your life, you may have no idea that you are being subtly and slowly pushed towards developing a full-blown chronic disease. What does all this have to do with your diet? Plenty! There are many ways we can influence that internal inflammation storm, and what we choose to eat is one of the most obvious and easiest ways to combat the storm and restore our bodies to a state of normal, healthy functioning. There are many different ways to eat, and different people respond differently to various foods. That’s one reason why so much of the diet dogma seems contradictory. But here’s something that we know: Plant foods, especially vegetables, are disease fighters in multiple important ways. At the same time, we also know that a high-carbohydrate diet, especially when made up mostly of refined grains and sugars, increases inflammation. Finally, we know that healthy fats are important for brain health and fat burning. How do we combine all three of these features into one sensible dietary plan? My answer: Ketotarian. At its essence, a ketotarian diet is a plant-based version of the trendy ketogenic diet, which has been shown to enhance brain function and stabilize blood sugar by providing your body with a more effective and sustainable form of energy (ketones) instead of quick-burning glucose from carbs and sugar. The beauty of the ketotarian diet is that it takes the benefits of the ketogenic diet, but emphasizes natural whole plant foods. What’s my beef with ketogentic diets? The conventional ketogenic diet can be extremely heavy in meat and dairy and doesn’t take into account the sensitivities that many people have to these foods—not to mention, it can ostracize anyone who would rather follow a more plant-based diet. Also, too much meat and dairy, especially lower quality or industrially produced versions, can be inflammatory.The ketotarian diet, on the other hand, leverages all of the benefits of eating a high-fat diet without the often-inflammatory effects of dairy and conventional, processed meats (which have been linked to cancer when consumed in high amounts). It’s keto for everyone. So why not just eat vegan or vegetarian? The ketotarian diet not only beats the conventional ketogenic diet for anti-inflammatory power, but also avoids the common mistakes I see many well-intentioned vegans and vegetarians making. At their core, totally plant-based diets can lead to more environmentally friendly eating habits and can have intensive detoxification properties, help fight cancer, and also keep blood sugar under control. However, in my clinic, as with the ketogenic diet, people often don’t practice these diets in the best way. I see far too often that many vegetarians and vegans live on bread, pasta, and other grains, along with beans and soy for protein, with barely a vegetable in sight. They have become, essentially, “carbotarians,” and the result over time can be severe deficiencies of vital nutrients, as well as dangerous levels of inflammation. The ketotarian diet makes it easier to create a plant-based food plan that’s full of healthy fats, clean protein, and colorful, nutrient-dense vegetables without all the dangers and nutritional mistakes of these other trendy diets. Since it’s low-carb, moderate protein, and high fat, you’re able to transition your body from a sugar burner to a fat burner and put your body into a state of ketosis—just like a conventional ketogenic diet, but with that anti-inflammatory, antioxidant-rich plant-based twist. The healthy, plant-based fats I recommend can be found in foods like coconuts, avocados, olives, and nuts. The best sources for ketotarian protein are seeds and nuts (not soy, which can cause hormone disruption) and legumes (with their gut-irritating lectins). Finally, carbs come not from starchy grains but from low-carb, nutrient-dense non-starchy vegetables like dark leafy greens. Keep your healthy fats high. If you eat a non-starchy vegetable, add some healthy fats. If you eat a healthy fat, add some non-starchy vegetables. Eat until you are satiated, then stop. Circling back to inflammation, the ketotarian diet is particularly good at quelling that inflammation storm. Research has shown that specifically eating a high-fat diet devoid of plant fiber actually increases inflammation, but eating fat the ketotarian way means no longer having to worry about diet-caused inflammation. By putting your body into a state of ketosis through a ketotarian diet, you will reduce inflammation by up-regulating the Nrf-2 pathway that is responsible for antioxidant gene induction, as well as turning on genes responsible for the health and function of your detoxification pathways. You’ll also promote healthier cell function. When the Nrf-2 pathway is activated, it calms inflammation and activates the powerful anti-inflammatory cytokine IL-10 and down-regulates pro-inflammatory cytokines. But that’s just the beginning. When your body switches from burning sugar to burning fat through the production of ketones, you get even more anti-inflammatory benefits. A ketogenic state produces Beta-hydroxybutyrate, which activates the uber-important AMPK pathway to reduce inflammation through inhibiting inflammatory Nf-kB pathways in the body. 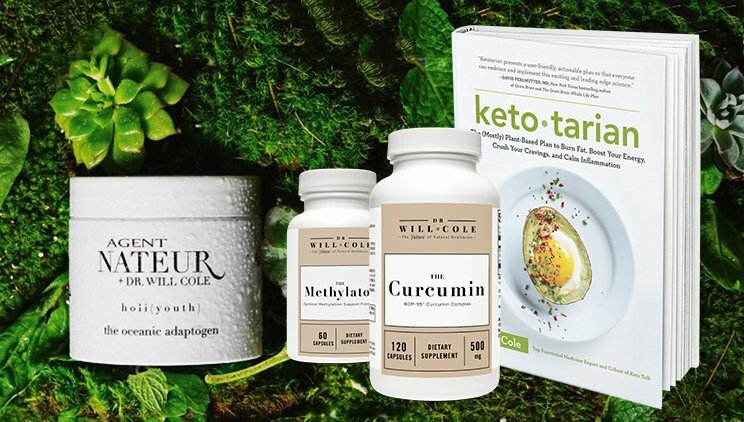 All this is a fancy way of saying that putting your body in the fat-burning state of ketosis through natural plant fats specifically soothes inflammation through a variety of biochemical pathways in your body. A day of ketotarian meals. Sometimes I practice intermittent fasting and don’t eat breakfast, but when I do, I like to start my day with a fat-loaded smoothie to wake up my brain. My preference is to blend spinach, full-fat coconut milk, a small handful of blueberries, half an avocado for creaminess, and a tablespoon of chia seeds for even more healthy fats and some protein. This smoothie is not just high in healthy plant fats but contains protein and is very low in natural sugar. I love a good zucchini noodle bowl with a homemade olive basil pesto for lunch because it is easy to make ahead and warm up at work. This is a simple yet nutrient-dense lunch. Tacos are my love language, so chances are good that on any given evening, you’ll find me eating some lettuce-wrapped roasted cauliflower tacos for dinner—heavy on the guac and detoxifying cilantro. Yum! See how simple and delicious this way of eating can be? Overall, ketotarianism is a practical and sustainable dietary strategy that can not only limit cravings and overeating through fat-adaptation (cravings and the compulsion to overeat are two major reasons diets fail), but it also reverses the inflammation storm so your body can work the way it should, unimpeded. Whether you want to be completely plant-based or add in meat every so often (I recommend fatty wild-caught seafood in particular), ketotarian is a great home base. Of course, as with any major dietary shift, it’s important to talk to your doctor to make sure you’re choosing the best foods for your body and health profile.